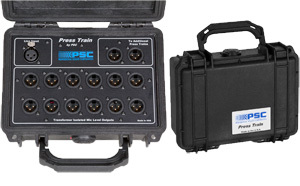 The Professional Sound Corporation® Press Train is a compact and easy to use in the field. It serves as a one input, 12 output passive audio distribution box designed to feed high quality audio for press conferences. This ruggedly built device is housed in a waterproof Pelican 1120 case for ease of use and shipping. The PSC Press train can be used in conjunction with our PSC Press Bridge or with any professional balanced line level source. Its input accepts a standard +4dBm balanced line level signal and provides 12 transformer isolated microphone level outputs. Our custom wound, mu-metal-shielded transformer's high input impedance insure that up to 8 PSC Press Trains can be connected to any professional 600 ohm balanced line without excessive line loading or distortion. Thus, you can obtain 96 separate, transformer-isolated, microphone-level outputs from a single line level source. Up to 300 outputs can be created with a PSC Press Bridge and 24 PSC Press Trains. The PSC Press Train has one line level input and two line level loop-through connectors that are used to feed additional Press Trains. Up to 8 PSC Press Trains may be connected in any daisy chain configuration without loss of sound quality. Interconnection of additional PSC Press Trains is accomplished with standard microphone cables. Each of the Press Trains' 12 isolated microphone level outputs have isolated grounds to eliminate ground loops.